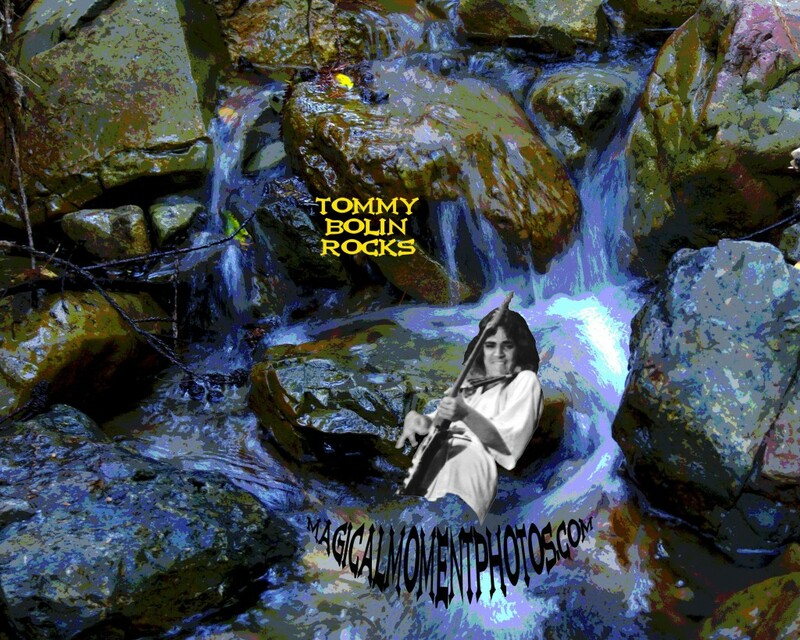 TOMMY BOLIN IN A CREEK ON MT TAMALPAIS. PHOTO/ART BY BEN UPHAM. Tommy Bolin was born in Sioux City, Iowa and began playing in bands around the city as a youth (“A Patch of Blue” and others) before moving to Boulder, Colorado, in his late teens. He had played in a band called American Standard before joining Ethereal Zephyr, a band named after a train that ran between Denver and Chicago. When record companies became interested, the name was shortened to Zephyr. This band included Bolin on guitar, David Givens on bass, and Givens’ wife Candy Givens on vocals. 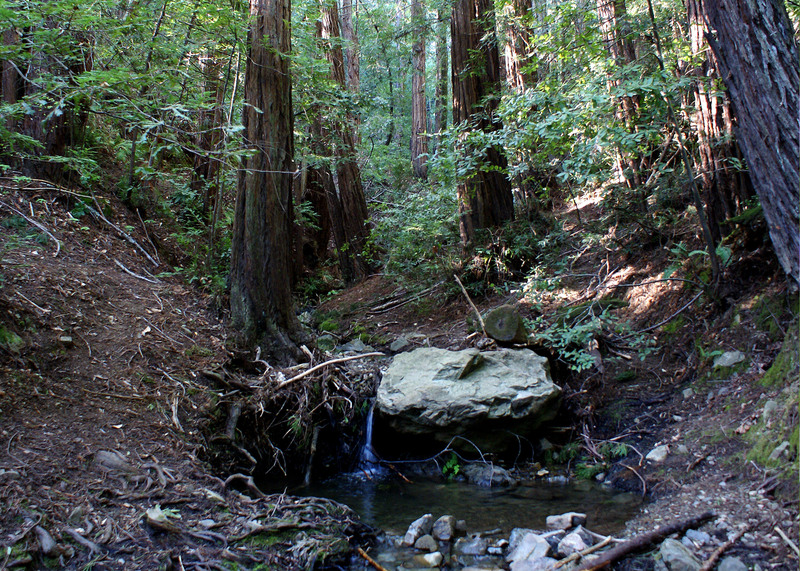 The band had begun to do larger venues, opening for more established acts such as Led Zeppelin. Their second album, entitled Going Back to Colorado, featured a new drummer, Bobby Berge, who would pop up from time to time in musician credits in album liner notes from Bolin’s later projects. In 1972 Bolin, at the age of 20, formed the fusion jazz-rock-blues band Energy. While the band never released an album during Bolin’s lifetime, several recordings have been released posthumously. He also played on Billy Cobham’s Spectrum album, which included Bolin on guitar, Billy Cobham of Mahavishnu Orchestra on drums, Leland Sklar on bass and Jan Hammer (also of Mahavishnu Orchestra) on keyboards and synthesizers. 1973 found him as Domenic Troiano’s replacement, who had replaced Joe Walsh, in the James Gang. He had two records with this band: Bang! in 1973 and Miami in 1974. After the Miami tour, Bolin wanted out of the James Gang. He went on to do session work for numerous rock bands and also with a number of jazz artists including Alphonse Mouzon’s album Mind Transplant, considered “one of the best fusion recordings of all time” by Allmusic reviewer Robert Taylor. He also toured with Carmine Appice, Moxy and The Good Rats. Bolin signed with Nemperor records to record a solo album. Bolin decided to do his own vocals on this album as well. Session players on this record included David Foster, David Sanborn, Jan Hammer, Stanley Sheldon, Phil Collins and Glenn Hughes. During the recording of this album, he was contacted to replace Ritchie Blackmore in Deep Purple. In the start of 1975, Bolin contributed some studio guitar assistance to Canadian band Moxy during the recording of their debut album. Later in 1975 saw the release of Bolin’s first solo record, Teaser, on the Nemperor label. After Ritchie Blackmore left Deep Purple, the band had a meeting and discussed whether to disband or try and find a replacement, and chose the second option. David Coverdale had been listening to the Billy Cobham LP (Spectrum). He decided he wanted Tommy in Deep Purple, and invited him over for a jam. Tommy showed up thin as a rail with his girlfriend in tow wearing a see through mesh mini-skirt. He plugged in to 4 Marshall amps and jammed with the band for 4 hours. The job was his. The band then relocated to Munich, Germany, to begin work in Come Taste the Band. Bolin wrote or co-wrote seven of the record’s nine tracks, including the instrumental “Owed to G,” which was a tribute to George Gershwin. Come Taste the Band was released in late 1975, and Australian, US and Japanese tours ensued. After Deep Purple disbanded in March, 1976, Bolin was back on the road with his solo band with plans for a second solo record. The band had a rotating cast of players which included Narada Michael Walden, Mark Stein, Norma Jean Bell, Reggie McBride, Jimmy Haslip, Max Carl Gronenthal and eventually Bolin’s younger brother Johnnie Bolin on drums. By mid-1976, CBS signed Bolin and he began to record Private Eyes, his second and last solo record.